I am pleased to report those of us along the U.S. East Coast who have borne the torment of this year's cold, wet summer will be rewarded this coming winter. There is scientific evidence and even an historical link between cool summers and snowy winters. Although the sun is shining brightly in the sky today, I am certain we've suffered enough so far this summer to ensure we get our snowy winter come November. Based on the evidence I've cited, this prediction of a magnificent, powdery, snowy winter is not just Pollyanna wishful thinking, it is science! 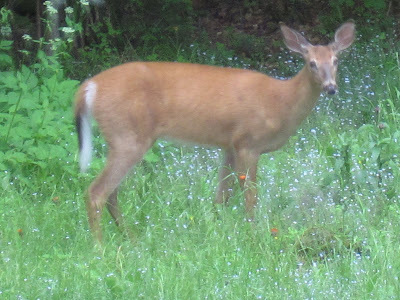 Today's featured Adirondack lifestyle photo is my yard doe, who enjoyed the Forget Me Nots until they died back.